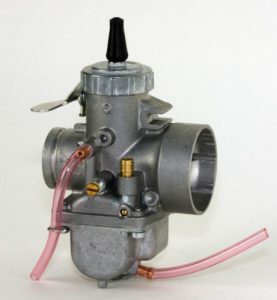 Riding a dirt bike in sand puts a huge load on the engine. The sand saps the power causing it to rev much higher, which in turn creates more than the usual heat. The revs are very high relative to the speed, so the radiator isn’t cooling as well as it should also. If the bike isn’t set up properly, lots of things can go wrong which can become very costly. Because the engine runs so hot, the oil begins to break down very quickly. 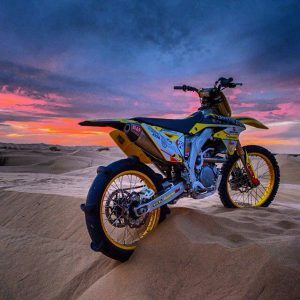 If your bike is getting close to a scheduled oil change it is a good idea to do it before riding in sand, so that the engine is getting the best lubrication possible. Then after your sand ride change it again. There’s no point even considering riding in deep sand if your tires are worn, or for hard surface riding. They will just spin and bury the back wheel up to the axle in the sand. Fresh knobblies are the way to go. Most tire manufacturers produce a sand riding tire, which has tall knobs and spaced well apart to scoop the sand. Generally, your tire pressures can be a lot softer, you can drop it down to 8-10 psi for sand riding. 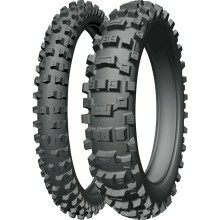 You would only use a paddle tire if you are riding in sand dunes with no hard packed areas. They will rip apart on hard surfaces and provide little traction when the bike is laid over. If your bike is fuel injected, then you have no worries. 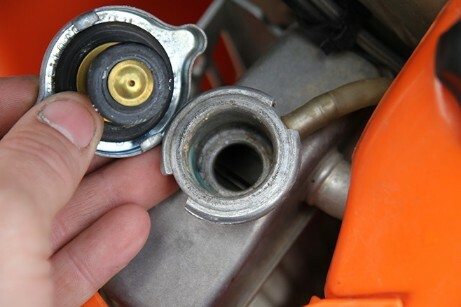 If your bike has a carby, then you should richen up the jetting to make sure your engine is getting enough fuel. Go up one or two main jet sizes and also one clip richer on the needle. You can usually get away without changing the pilot jet, as you’re usually riding with the throttle wide open in the sand. When riding in deep sand you need to keep your weight towards the back of the bike and try to keep the weight off the front wheel. 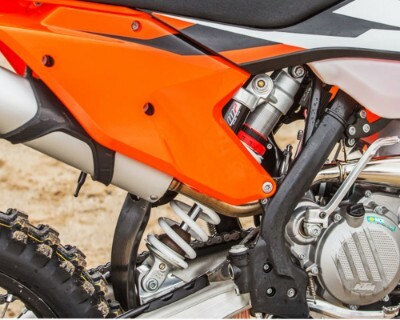 Most good sand riders increase the rear ride height by 5 to 10mm to help keep the weight off the front wheel. 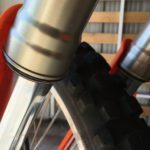 You can also slide the front fork legs down so that the top is flush with the top of the triple clamp. Most riders also tend to firm up the suspension to handle the sand jumps and whoops, and slow the rebound in the rear to prevent the bike bucking so much. 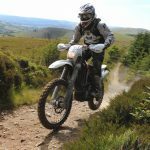 You should always clean your air filter after every sand ride, and ideally after every ride, even if it wasn’t a really dusty ride. 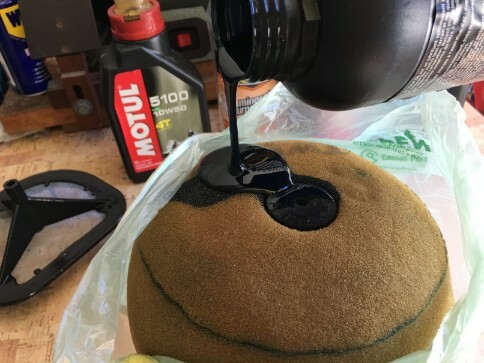 Sand is far worse than dirt, and if it gets into the engine it will act like a grinding paste on the engine parts, and you will be up for a major rebuild. Sand tends to get in everywhere. 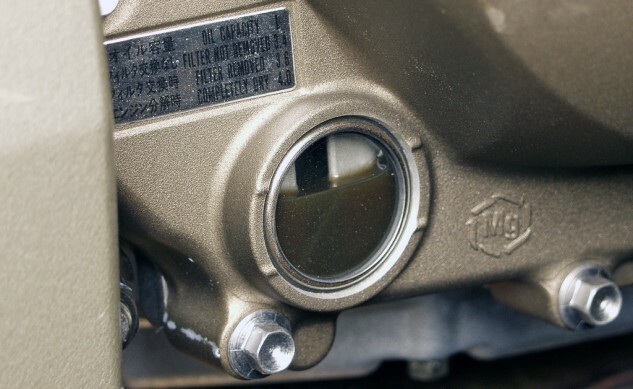 If you haven’t flushed the radiator coolant in over a year, it is a wise precaution to do it before you hit the sand. It will be getting very very hot, and if the cooling system is not operating at 100% you are liable to end up with a cooked engine. Sand is especially hard on chains and sprockets, brake pads, and any exposed moving part. They all wear extremely quickly in the sand because it is so abrasive. 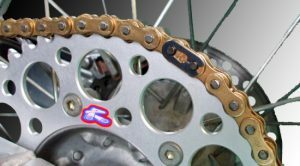 The chain tends to attract the sand because of the chain lube, so always use the dry, waxy non-fling type which is not so sticky. It’s a good idea to reapply it for the road ride home after you have finished riding in the sand if you are not transporting the bike home. 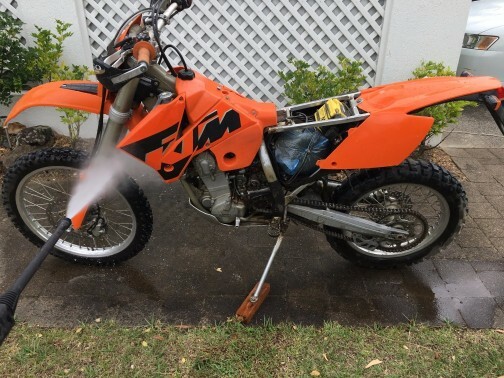 Ideally, you should wash your bike as soon as you get home after riding in sand. Even leaving the bike overnight it will start rusting, especially if you have been on the beach in a salty environment. It’s a good idea to spray anything likely to rust with WD40 after your wash. 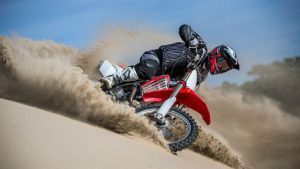 Riding a Dirt Bike in sand can be the fastest way to destroy a bike, but if you take the time to prepare your dirt bike for sand, it won’t be a problem. I’ve been riding dirt bikes in the sand for over 30 years, and have never had any issues. Despite all the dangers, it sure is a lot of fun! Please feel free to add your comments if you have any sand riding tips to share.